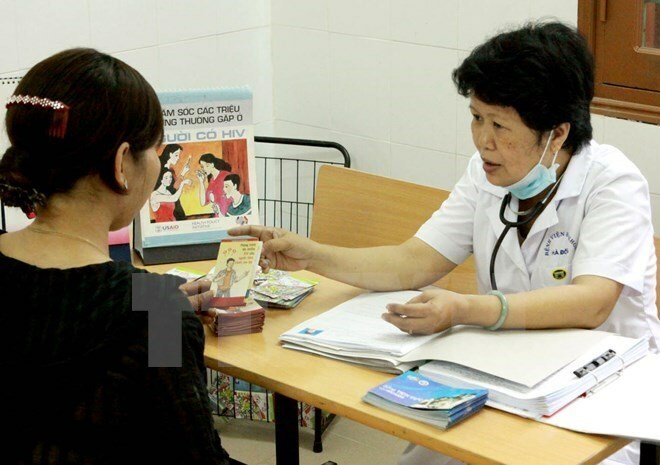 Vinh Phuc (VNA) – The northern province of Vinh Phuc has paid great attention to the prevention of HIV/AIDS spreading in the community, especially the transmission of HIV from mothers to newborns. According to the provincial Centre for HIV/AIDS Prevention and Control, the province has 1,963 people living with HIV, including 1,405 becoming full-blown AIDS. The province has recorded 707 deaths of AIDS. Total HIV cases receiving treatment are 742, including 27 children. The province has carried out activities to prevent mother-to-child HIV transmission since 2007, with 13 facilities providing prevention services. As of June this year, the centre has provided prevention treatment for 98 women before and during their pregnancy as well as in labour period. All the infants were born without HIV. Currently, Vinh Phuc has given facilities supplying medicine for preventing mother-to-child HIV transmission, with ARV medicine available for pregnant women.